A group of activists creates street art in Armenia. A sprayer and a photographer: the former to create the art, the latter to keep it alive. A group of activists creates street art in Armenia. Due to their opposition to the state, their work is usually erased immediately. Narek Aleksanyan, a photojournalist, documents what they do and publishes the photographs on the web. The video documenting this process was shot in in Yerevan, the Armenian capital, in November 2015. Counterstrike is a group that has created many of the graffiti and paintings shown in the video. It is concerned with current political and social issues in Armenia and chooses mainly public spaces for their street art. Artak (featured in the video), Herbert and other members of the group have been detained by the police several times and charged for installing a banner against president Serzh Sargsyan in front of the parliament building. 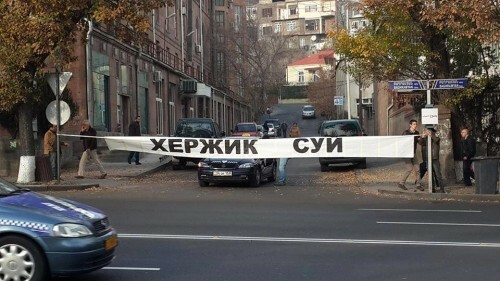 A banner with the modified name of Serzh Sargsyan, president of Armenia, in Russian letters / Facebook. Narek Aleksanyan is a photojournalist based in Yerevan. He covers demonstrations, social issues, urban life and more. 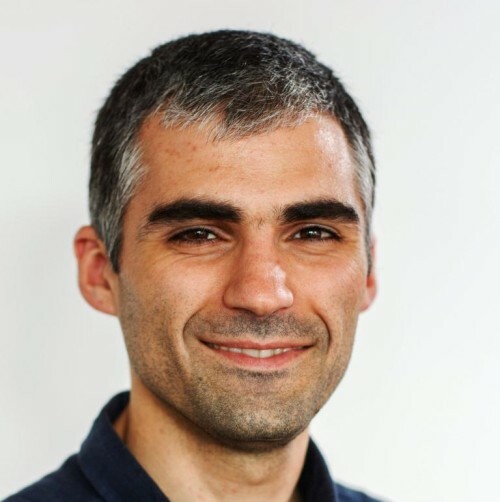 He works at Hetq, an online newspaper published by the Investigative Journalists NGO in Armenia. 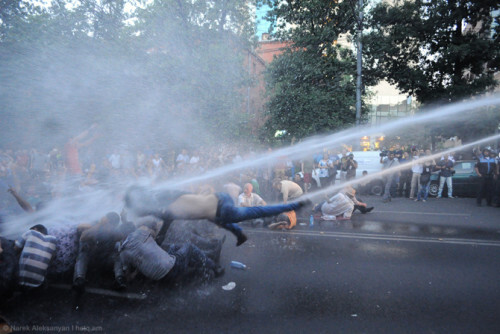 His photos of #ElectricYerevan, a demonstration against a hike in electricity rates in Armenia, went viral in June, after police used water cannons to disperse demonstrators.